Late that night I stood at a third-storey window of the largest hotel in the town. I looked past the regular pattern of streetlights towards the dark country beyond. A breeze came in warm gusts from the north. I leaned into the surges of air that rose up from the nearest miles of grassland. I composed my face to register a variety of powerful emotions. And I whispered words that might have serve a character in a film at the moment when he realised he had found where he belonged. The landscape—definitive and incomprehensible—shapes the singular society that has evolved there. But this is an allegorical, alternative Australia. Wealth is tied to the ownership of land, longstanding and rooted in the history of exploration. But it is maintained through a currency of ideas. Every “cultivated plainsman” has an ever expanding library to accommodate the growing disciplines of thought and speculation that occupy this idiosyncratically intellectual world. Our protagonist takes time to listen to other plainsmen and build an understanding of the history, trends, and competing concepts of the plains and their relation to the coastal areas (or “Outer Australia”) that have come and gone. It is a complex mythology. His goal is to secure the patronage of a landowner who will support his work on his film project. He succeeds, or so it seems, but the cost, if in fact that is how he ultimately would see it, is extracted gradually and steadily over time. Of course, the literature of the plains abounds in accounts of childhood. Whole volumes have expounded in profuse detail the topography of countries or continents as they were descried under faltering sunlight in the only hour when they were said to exist—some fortunate interval between almost identical days before they were engulfed by events too trivial even to be remembered. And one of the disciplines that most nearly resembles what is called philosophy in far parts of Australia is known to have originated in the comparative study of scenes recalled by one observer alone and accounts of those same scenes by the same observer after he had acquired the skill to attempt a fitting description of them. I may take pleasure occasionally in the sight of her so close to the crowded shelves that the pallor of her face is momentarily tinted by a fair multiple glow from the more hectic of the jacketed volumes around her. But I myself prefer not to be seen in the places given over to Time, no matter how nearly I might seem to approach the plainsman’s view of all that might have happened to me. I have a fear, perhaps unreasonable, of finding myself beguiled by images of what almost came to pass. Unlike a true plainsman, I do not care to inspect to closely those other lives lived by men who might have been myself. If you have lived in the plains, as I have, this novel will have a special resonance. You will recognize the ineffable qualities of space and light (although for those of us in the northern hemisphere, there are southern peculiarities—warm winds don’t come from the north here). What it means is another matter. It is a tribute to the book’s shifting opaque character, that you sense you cannot quite observe it in the right light. But this is an intelligent, provocative, fascinating work. For an Australian reader there are likely themes others might not notice and yet it does not matter. This is a book that has to be experienced to be appreciated and, I would argue, best met without preconceptions. Nothing will quite prepare you anyway. As I read it I was struck by parallels between the way residents of the Canadian “plains” (the prairie provinces) see the big cities, Vancouver, Toronto and Montreal. There is more diversity and culture here than many expect (but lots of narrow mindedness too). This book would be great for a discussion group because there are many ideas to explore. This is an exquisite review, Joe. I love this author’s writing, it’s like magic. Thanks Lisa. A comment you made about him when I was visiting convinced me I had finally read his work. Nice review of a novel that has become my all time favourite and led to an almost obsessive reading of and about Murnane over the last six years, as well as collecting the signed first editions of all his books (first time that happened to me), second hand material, articles and the few dissertations I have found. Also a Borges fan I can not escape the vague feeling of Murnane’s plains as something similar to Borges’ Aleph, where all space and time is present at one finite point (the Aleph being a small glass ball). Like Lisa I find Murnane’s writing almost magical. I imagine I will return to this novel more than once. I picked up two other Murnane books with this one before I left Sydney. I love how you are exploring some of our best literature after your visit. 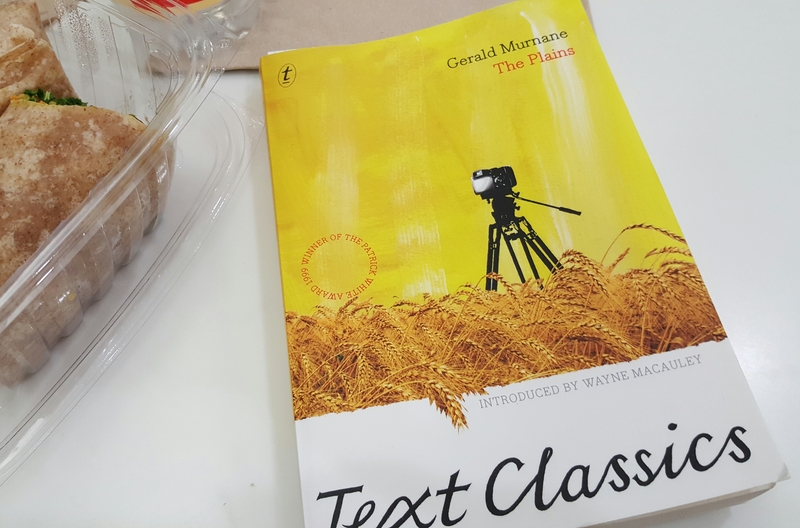 There is a wonderful “Music & Literature” edition that looks at Murnane, worth hunting down. Thanks for stopping at our backwater for a while. I will have to look into getting that M&L issue. I loved my trip to Australia. I hope to be back some day. Nice work on presenting this curious novel. I read it recently, too, and was immediately hooked, though mystified as to how to write about it. Thanks. I wasn’t sure if I would write about it. Every few days I worked on this for a while until I had a bit of a review. It’s certainly a very open text. It reminded me a bit of Blanchot’s Aminadab in that regard, and in the possibility of reading it as an allegory. I also thought of Bernhard’s The Lime Works, solely with respect to the epic creative project that is forever researched but never started. That is a trope that I particularly enjoy in literature, and one which Murnane explores splendidly. As your last review caused me to buy a book immediately I am temporarily resisting – but only temporarily. Very nice. This author is completely unknown to me, but from the review and comments I get the impression that’s rather an oversight on my part. He is highly respected, but not that well known outside of Australia. Even there he is very much a “literary” author. This book was just re-released in North America so it has been getting attention. I’ve been aware of him for some time, but had to go all the way to Australia to decide it was finally time to pick this, his best known book, up. I posted about Inland some time back, and like you found his prose exhilarating and strange at the same time. Unlike anything else, in my view, though I can see why others have likened it to Borges, Calvino and co. But he’s sui generis. Inland is also a long examination of plains – Hungarian, American and Australian: they merge and shimmer into each other intriguingly, and the narrative voice is slippery. I hadn’t thought about him being funny, but now you mention it…yes, he is. Great insight, Joe. That’s good to hear about Inland. I brought that back from Australia too. Inland is structurally a bit strange though with two quite separate parts. I still haven’t figured out how they connect.